Ditching Spotify for Rdio? Giving Tidal a try alongside Deezer? 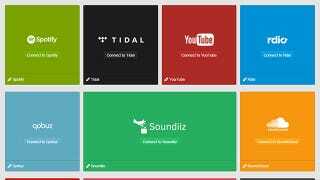 If you’ve got carefully curated playlists in one streaming service then you might be reluctant to start again from scratch with a new one, but Soundiiz lets you transfer your song lists between apps with the minimum of fuss. Head to the Soundiiz Beta website and click the Start converting button to begin. Spotify, Rdio, Deezer, Last.fm, SoundCloud, Tidal, Napster, YouTube, iTunes, Qobuz and Xbox Music are all supported, and once you’ve confirmed your account credentials you can simply drag and drop playlists between each service. Due to the different music libraries available with each app, the conversion may not work perfectly each time, but in our tests we found it to be quick and accurate. If you need to shift long lists of tracks between services, then Soundiiz is definitely worth a look, even with the occasional bug you would expect from a beta service.